This week was incredibly busy, so boiling chicken saved me from dinnertime meltdown. Using advice from a friend, I added honey, salt and pepper to the water and went ahead and boiled it for over an hour. If you have this kind of time frame, the meat will literally fall off the bone. If you need to save time (or your sanity), boil a whole chicken at the beginning of the week, then use your imagination with the leftovers. The microwave will be your friend! Last week it was a red wine pairing with cherries. Tonight, I followed leftover capellini (with sauteed mushrooms, bleu cheese crumbles, and tomatoes) with another summery pair: Kendall Jackson Chardonnay (my mom’s favorite) with California white peaches. It’s a delicious, guilt-free dessert that satisfies your sweet tooth! 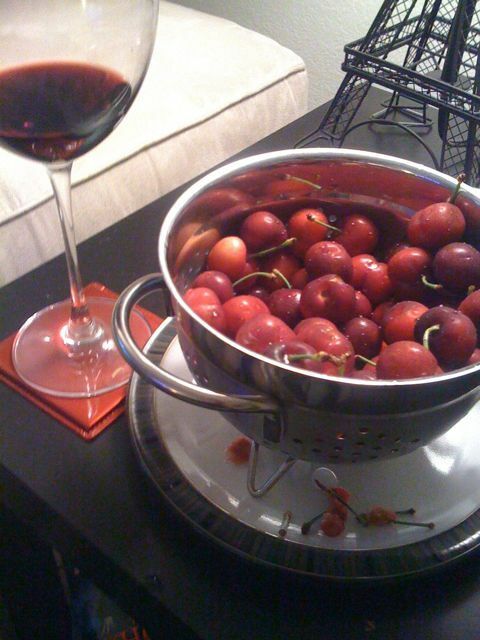 I’m no wine expert, but Sangiovese and fresh sweet cherries make an extra sweet pair. After a weekend of feasting on pizza and other treats, my palate was pleasantly surprised by this good-for-the-heart dessert! So we recently moved to Mountain View and were delighted to find an entire street full of great restaurants, stacked up on after the other along Castro. So far we’ve been to Sono Sushi, King of Krum Siam Thai, and Neto, but Fridays are pizza night in the Jackson house. Last week we tried Z Pizza. I was a thumbs up, David was somewhat lukewarm. Have any suggestions on what pizza place to try next? As long as they deliver to Mountain View, we’re game! Lately I’ve been too busy to cook, which is usually something I look forward to at the end of a long day. The creative – often meditative – process of preparing a meal is how I wind down. But time is of the essence in the kitchen, which leaves me somewhat uninspired as of late. Fortunately, my muse is a mini accordion folder of recipes ripped (literally!) from the pages of Everyday Food and divided into themes and categories. I’ve been a subscriber for 4 years or so and the simple concepts and mouthwatering visuals are easy to follow, and produce consistently tasteful, crowd-pleasing results. Plus a lot of times the ingredients are already in your cupboard! I’ve collected quite a stash over the years, which is added to each month when a new issue arrives. Check out Everyday Food for recipe inspiration, or come raid my stash!